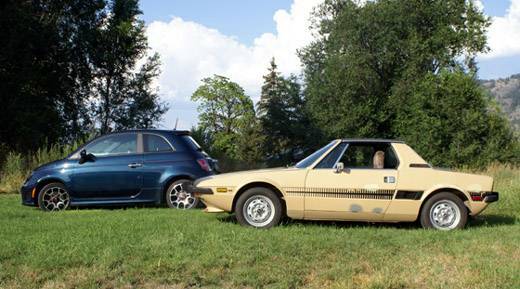 by Brian -- The Fiat X 1/9 was the first affordable mid-engine sports car for the masses. It has all of the looks of a Ferrari or a Lamborghini but at a much cheaper price, and with a removable top. The X 1/9 was produced from 1972-1989, but we did not see the X until 1974. The first X’s are highly desirable, and arguably look the best of all of the US market cars. 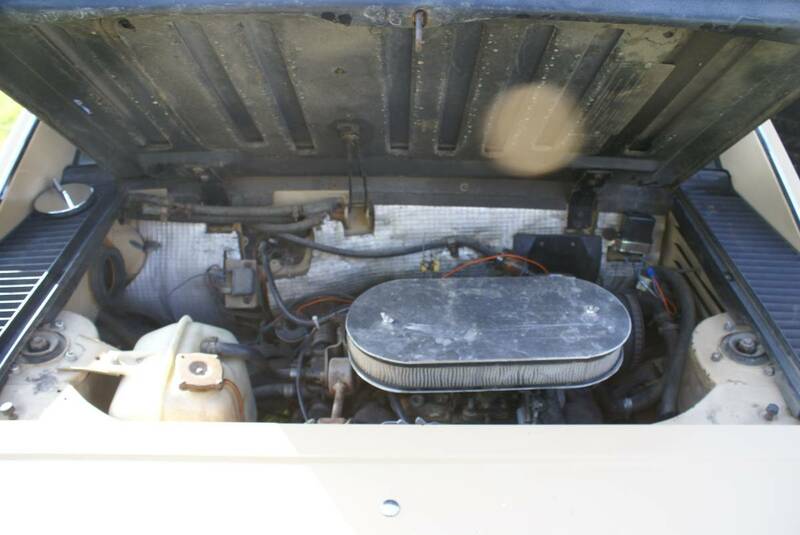 This 1974 model looks to be a solid low mileage car that needs a little TLC. 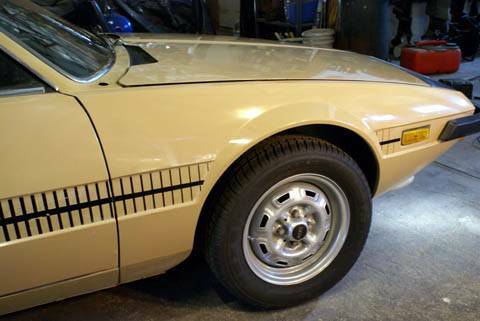 This 1974 Fiat X1/9 Bertone is available in Oroville, Oregon on Portland Craigslist for a mere $3000. The X 1/9 is a car that exudes so much character you cannot help but smile when you drive one. This X is a 1974 model, so it sports some one year only items. The biggest thing, or should I say smallest is the 1974 “Euro style” bumpers. These were only available in 1974 in America. These bumpers are highly desirable and really make the car. In 1975 and upward the bumpers got bigger and gawkier taking away some of the car's charm. Also this car has the interesting 1970s iconic stripes in the body line. This tan color is pleasing to the eyes, and the car looks to be a nice original survivor. The rockers, rear wheel arches, and lower rear wheel arches appear to be in amazing shape for an X 1/9. All of the factory hardware looks correct, and in the correct placement. A paint job and some TLC would really put this car in the collector car territory. The drivetrain and engine look clean and appears stock aside from the newer air cleaner. This X being a 1974 model means that it is equipped with a 1300cc engine and a 4 speed gear box. The little 1300 is eager to please and propels the car quickly enough to push through the curvy roads of your choice. The 4 speed cars have a more positive feeling shifter than the 5 speed cars. You will not be winning any races with this car, but it will be a tremendous joy to drive on open roads with the roof off and the engine humming its tune. The X’s cockpit is delightful to say the least. 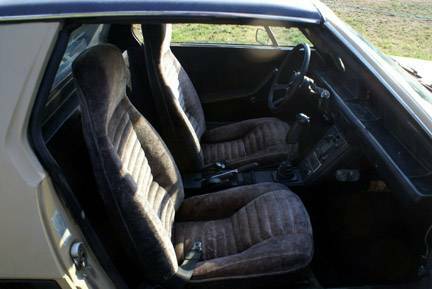 The interior is claimed to be in good condition with mention of the interior being reupholstered, but it looks muddy and strange in the photos. The 1974 cockpit is a pleasure to be in and to operate. The earlier center console and instrument cluster lend to the cars 1970s roots. Even the speaker covers in the doors seem to sing a groovy 70’s tune. 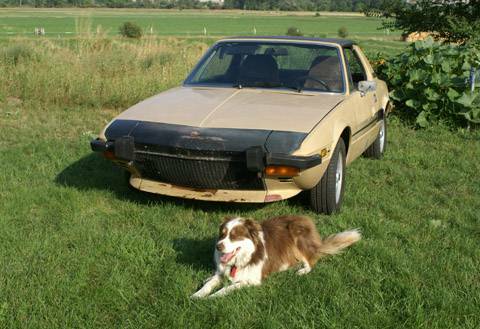 This 1974 Fiat X 1/9 could easily become a show car and a collector car with some paint and other general TLC. The low mileage, originality, and upkeep of this X make it seem as if this is a bargain price. The 1974 Euro style bumpers are beyond scarce now and the prices have gone through the roof. Finding an X 1/9 in any condition that is running and isn’t eaten up with rust is just about an impossible task. Don’t miss out on this excellent opportunity! Brian has owned over 30 cars, many of which my friends have classified as slow and strange. He currently owns 2 1971 Honda N600s, a 1991 Miata, and a 1991 CRX Si. Seeing it with the Abarth makes me think what an awesome power infusion that would be to shove a modern Abarth drivetrain in the back of the little X1/9. Are you being ironic with your effusive praise? Show car with a little work? You guys moonlighting writing Craigslist ads? The final picture begs for a caption: "Dog for sale." Brian, after your Ferrari/Lamborghini comparison, I was expecting a comment about the X 1/9 being a scaled down version... You know, half the cylinders of an F car, but at least twice as many things to go wrong? Or, like the F and L cars, it has an engine, and a transmission. And 4 tires? Perhaps musings on what to call this diminutive (and I mean that in all senses of the word) little car that is not quite a Ferrari or Lamborghini? Like taking the first and last parts of those marques, because, like those other Italian cars, this little guy also has a front bumper, a back bumper, but... ahhh... less in between? Or perhaps best of all: If you drive a Ferrari, and then the X 1/9, you will wonder why you did. Oh, for the days when, if you wanted one of these, you could just drive over to any local interstate with a moderately uphill section and drag the one of your choice home from the shoulder. Well... I am the Owner, and it is vary original car always pampered. It is for sale but not advertised.